The My Heart Will Go On singer lost her husband and manager Rene Angelil in January (16) following a long battle with cancer, two days before Celine's brother Daniel passed away, aged 59, from the same disease. Her sister Claudette has now revealed there is more bad cancer news in the family as their sister Liette's husband, Guy Poirier, is in a care home being treated for the disease, which has spread to his lung, brain and bones. "My step-brother is at the Maison Adhemar-Dion and he is still conscious," she told Echos Vedettes magazine. "My sister (Liette) is with him and she is very strong. People of the Maison are angels and they are taking very good care of our step-brother". Maison Adhemar-Dion, named after Celine's father Adhemar, is a palliative care unit in a suburb outside of Montreal in Quebec, Canada. Adhemar passed away from bone cancer in 2003 and Daniel was also treated at the unit. The family are asking for donations to be made to the facility. 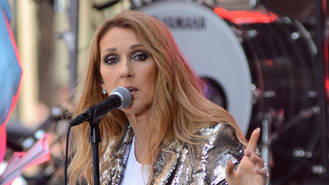 Following her husband and brother's deaths, Celine took time out of her Las Vegas residency but returned in February (16), finished her French album and performed Queen's hit The Show Must Go On at the Billboard Music Awards in May (16). "I feel wonderful. I feel strong, I feel good," she told U.S. show Today in July (16). "It's been a journey. It's been hard seeing the love of your life suffering for the last three years, it's been really hard, but millions of people are going through this, and I feel very strong because not only did he love me so much for many, many lives to come, he gave me three magnificent kids, so much knowledge, stability, and confidence." Celine, who has three sons Rene-Charles, Nelson and Eddy with her late partner, also revealed her desire to get a tattoo in his honour.